The pictures aren’t the best quality for zooming in, but it appears the riveted attaching points for the front fenders may have been rusted out. It looks like a very fast coating of body filler to cover the hole then quickly painted to cover up the quick fix. The passenger door does not align properly with the cab or front fender. It appears there is a piece of diamond plate welded to the top front of the running boards. The rear passenger fender has been welded to the bed side. There are other body problems, but the big ones I mentioned point to the fact that the repairs were done haphazardly, and not much if any thought of quality workmanship. I would be worried about how the mechanical modifications were thrown together. Man are these old trucks tough! Glad to hear neither you or your truck sustained any damage! How to keep running board painted?? My grandfather had polio when he was a child so stepping over his car running board wasn’t an option for him. He cut out a square piece of rubber backed carpet, punched a hole in the edge of it, and tied a piece of cord to it. He would lay the carpet on the running board before he got in. After he was in and seated, he would pull up the piece of carpet with the cord. Before he got out he would just drop the piece of carpet onto the running board before climbing out. It may be a little more challenging dropping the carpet onto a truck running board since it’s further down than a car, but you could probably use the cord to lower it into place. 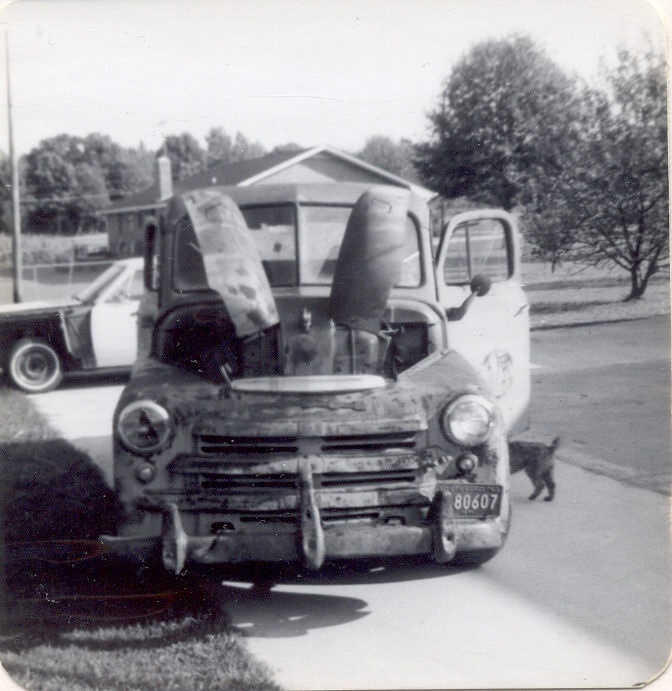 I had a problem with my 38 Buick. It would run fine around the yard and short slow trips, but if I tried going more then 5 miles or running at higher speeds, it would die. Someone on another truck thread was having a similar problem and was told the reproduction gas caps were not vented. Longer trips and faster speeds caused a vacuum in the gas tank and was starving the engine. I checked my Buick gas cap and sure enough, no vent hole. I haven’t had nice enough weather to try it with a vented cap, but I’m hoping that will solve my problem. Might be worth checking as it seems you have checked everything else. One of the choke knobs should say throttle. I may order a part from these people in the future, but I would never have them make a part for me! I had them make a transmission cluster gear shaft and it was horrible! The machining marks were terrible. It would have destroyed the needle bearings in short order, plus it wasn’t heat treated properly. I was suspicious after looking at it so I took it to a machine shop and asked them to check the hardness. It was just unhardened mild steel. They did refund my money, but I wasted a lot of time. Can we get a good Windshield Gasket? I used steele’s windshield seal and i am very pleased with it. 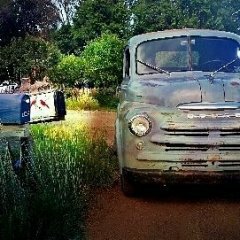 Posting some pix of the '51 pickup I recently got. That sure is a nice looking truck! Roxanne - She don't have to put on the red light. I sanded and buffed one of my original wheels that still had an area of good paint on it. Then I took it to Finish Masters and had them match it for me. I’ll try to attach a picture of my finished wheel and a picture of the formula. I thought they did an excellent job of matching the original color. Kind of makes you hate to have to cover them up! It’s hard to tell in the pictures, but it looks like you painted the shoe contact surface on the inside of the drum. Won’t that gum up your brake shoes? I don’t know, that’s why I’m asking. I had a similar problem on a 1938 Buick. It turned out to be a bad intake manifold gasket. It was pulling plain air in rather than the fuel air mixture. When I would spray starter fluid near the leaking gasket it would pick those cylinders up. Just watch out for the fan and for safety’s sake, I did it when I first started the engine before the exhaust manifold got hot. Good luck! Some problems can be a real bear to figure out.